The men of the Malcolm X Institute of Black Studies celebrated the Institute’s 40-year history and looked to its future with a series of presentations, panels, and video interviews that revealed the constant struggles and myriad accomplishments men of color have experienced at Wabash College. More than 50 alumni members of the MXIBS, which was founded in 1971, returned to campus to recall the past and plan for the future under the leadership of Dr. Michael Brown, who is the Institute’s third director and also serves as Associate Dean of the College. Dr. Brown taught at Wabash for four years prior to an 11-year stint at Emory University, where he taught theology and religion and mentored graduate students. His return as the Institute’s new director has brought enthusiasm for the potential of the MXIBS to serve students of color — and the entire Wabash community. 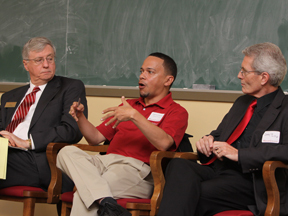 Brown was praised by one of his former Wabash students, Luttrell Levingston ’98, who moderated a panel talk featuring Dr. Brown, President White, and Dean of the College Gary Phillips. Brown — and many other alumni, faculty, and administrators — spoke of the tension in which the Institute has existed since its founding. When it was developed, students hoped three important things would happen — a Black Studies program would emerge within the curriculum; more African Americans would be hired to faculty and staff positions; and African American students would have a place of their own on the campus. Dean Phillips said the MXIBS has always — and will continue — to play a critical role in the academic life of the College. A year-long program review led by an advisory committee working with current MXIBS members defined three ways the Institute could have a positive impact on the College: A continuing focus on student success, cultural enrichment, and community engagement. 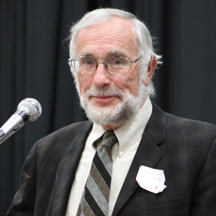 Keith Nelson ’71 was one of the Institute’s nine founders and was instrumental in organizing the 40th anniversary event. “We had an idea and we called it the Malcolm X Institute of Black Studies,” Nelson said. “We had a responsibility to each other, for each other, and to our community. And through Black Studies, we learned about each other and taught each other. 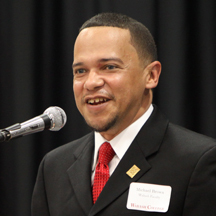 Dr. Peter Frederick, a 35-year member of the Wabash faculty who, with Professor Finley Campbell, helped students establish the Malcolm X Institute of Black Studies, was named an Honorary Alumnus in the Class of 1992 at Saturday’s banquet. Frederick recalled the meeting at which the students decided what to name the center. Wabash Trustee Robert Wedgeworth ’59 attended Wabash long before the Civil Rights Movement and the MXIBS, yet the former Dean of Library Science at both Columbia University and the University of Illinois has long been a supporter of the students. Looking backward and living forward became a theme for the weekend. And the tension of evolving the Institute to meet the needs of today’s students — while honoring its past — provided a useful tension to guide conversations. In some ways, that tension mirrors the tension of the Institute itself — student club or academic center, place of refuge or place of outreach, place of nurturing support or a place of strength and independence? “There’s an ambiguity and tension with the Institute… I see these current students and they are quality men with great potential and I listen to us struggle with a re-definition of what the Institute should be. And over time, when we have struggled like this, what have we done? We have trusted our students. Wedgeworth provided two moments of excitement Saturday night. 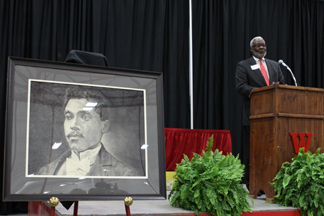 First, he unveiled a painting of Wabash’s first African American graduate, John Evans, which he and his wife, C.K., had commissioned. The piece will hang in the Institute. Moments later, Wedgeworth announced that he and C.K. had pledged $10,000 as seed money to establish the Horace Turner Fund at the Malcolm X Institute of Black Studies in honor of Turner, who directed the Institute for 35 years. He also said his family would match 50 percent of additional gifts from alumni with hopes of having a $40,000 fund by December 2012. Seconds after Wedgeworth made the announcement, at least a dozen alumni rose to their feet shouting words of praise for Turner and about their experiences, and pledging money to grow the fund. Keith Veal ’92, a frequent admissions and alumni volunteer for the College, put the 40-year history and hopes for the future in perspective when he suggested that each generation of students develops its own identity for the Institute.